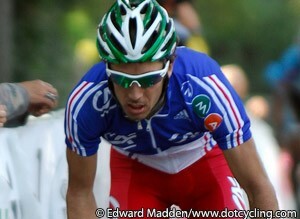 It took awhile, but Christophe Le Mevel has finally officially signed with the Garmin-Cervelo team for 2011. La France Cycliste makes the two year deal known and lays to waste the rumors that the transfer might not go through due to the influx of Cervelo riders in next year's team. Cyclism'Actu reports that Topsort Vlaanderen's Kristof Vandewalle will be the ninth new addition to the QuickStep team for 2011. He joins the ranks of Niki Terpstra (Milram), Francesco Chicchi (Liquigas), Andy Capelle (Willems Verandas), Marc de Maar (United Healthcare), Jan Tratnik (Zheroquadro), William Van Keirsbulck, Frederique Robert, and Julien Vermote. Feltet.dk reports that Brazilian sprinter, Luciano Pagliarini, will get a chance to return to Europe after spending the year racing with the soon to be defunct Scott-Marcondes Cesar team in Brazil. The once promising sprinter has never quite lived up to the expectations of his youth, but he will get another chance to show off his wares - this time with Eusebio Unzue's Movistar team. Pagliarini has previously raced for Lampre, Liquigas, and Saunier Duval. Marcel Wyss has found a home out of the collapse of the Cervelo Test Team. The Bernese rider will move from Cervelo to Geox for the next two years. The folding of the Cervelo team was of particular worry for Wyss, as he has been out for an extended time after tearing his patellar tendon at the GP Kanton Aargau/Gippingen in June. The rehabilitation process has been long, but he hopes to return in October to finish up the last few weeks of the season, according to Sport.sf. Wyss will join the likes of Denis Menchov, Carlos Sastre, and Fabio Duarte. Australian Simon Clarke will make the jump to the ProTour in 2011. The 24 year old ISD-Neri rider, already an Australian National Champion, will join the Kazakh team next season and further strengthen its foundation of young riders, according to Cyclism'Actu. The sentence of Francisco Javier 'Patxi' Vila was reduced from 24 to 18 months over the winter, paving the way for the disgraced climber to return to the peloton a little earlier than previously expected. The Spaniard will be allowed to return to racing on November 5th, right as the season finishes. Like a notable doper before him, the 34 year old former Paris-Nice stage winner will find a home next season with the Ceramica Flaminia team, who just lost the services of Riccardo Ricco, according to WielerFlits. On the cleaner side of things, the team is picking up a number of younger talent including De Rosa's Claudio Corioni (3rd in Stage 4 of the Coppi e Bartali), Giuseppe Maria of Amica Chips-Knauf, and 4th at the GiroBio, 21 year old Alessandro Stocco. 26 year old Spanish climbing talent, Sergio Pardilla, will return to his homeland in 2011 as a ProTour rider. The mountains specialist currently rides for the modest NGC-CarmioOro team, but with a number of solid rides throughout the season including overall victory at the 2.1 Vuelta a la Comunidad Madrid, the doors to the ProTour opened wide. WielerFlits reports that the young rider was in talks with the Italian Geox team, but instead chose to head home to the Movistar team led by Eusebio Unzue, which will include two other new great climbing hopes for 2011 as well: Benat Intxausti and Xavier Tondo. UCI caught out by counterfeit bank guarantee?